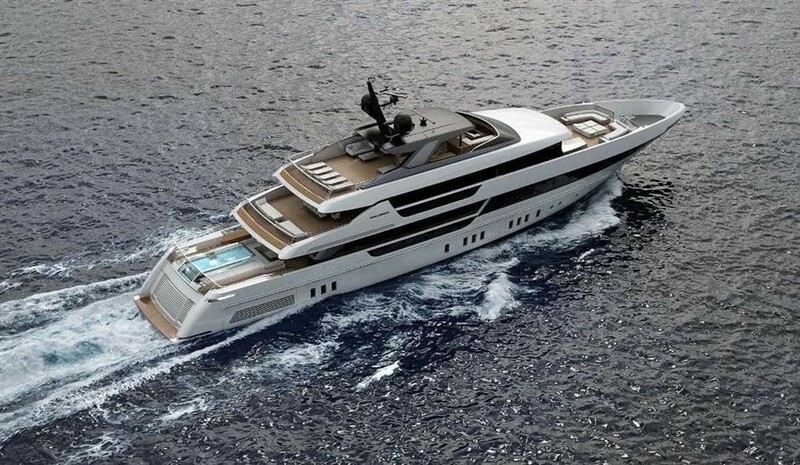 A 52m Yacht with a spectacular glass-bottom swimming pool and beach club. 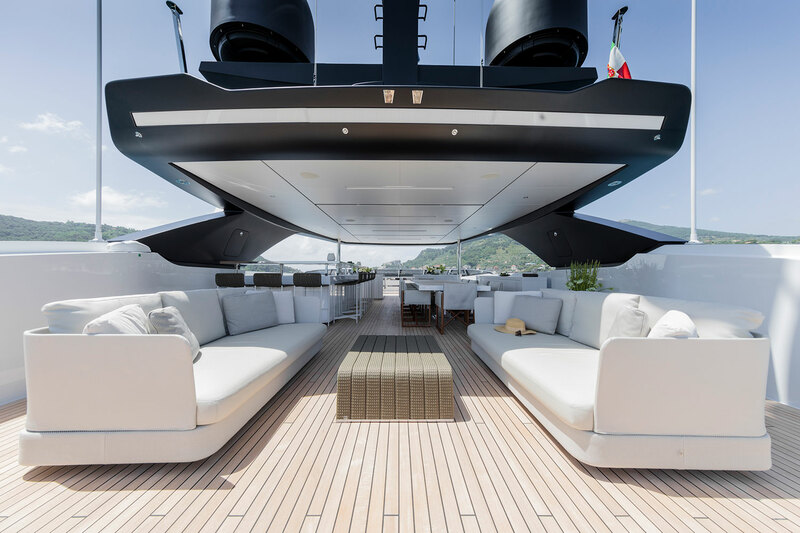 Seven Sins is a beautiful 52-metre superyacht by Sanlorenzo. 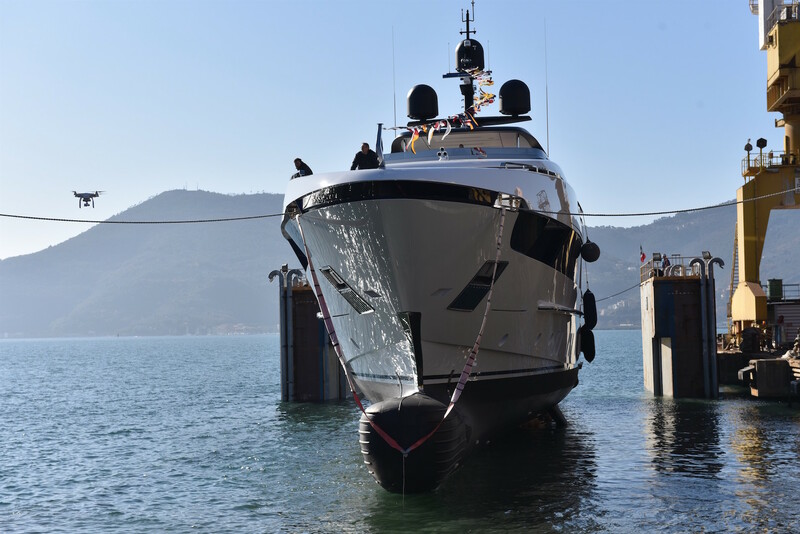 This is the first vessel from the new 52Steel line. 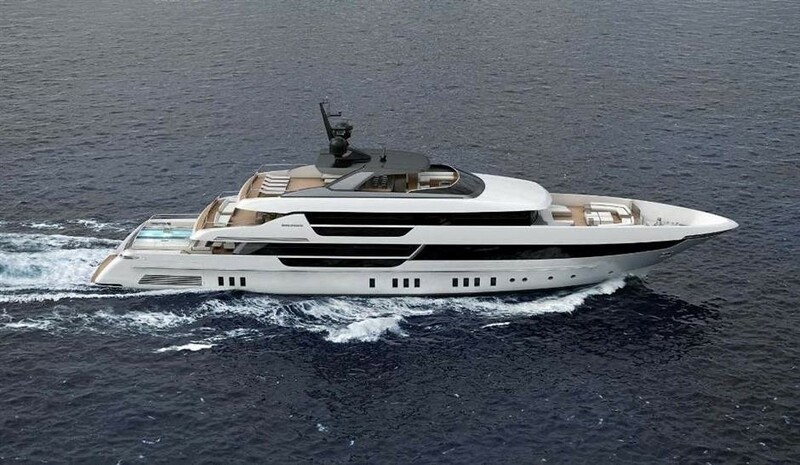 Her distinctive exterior is a work of Officina Italiana Design. 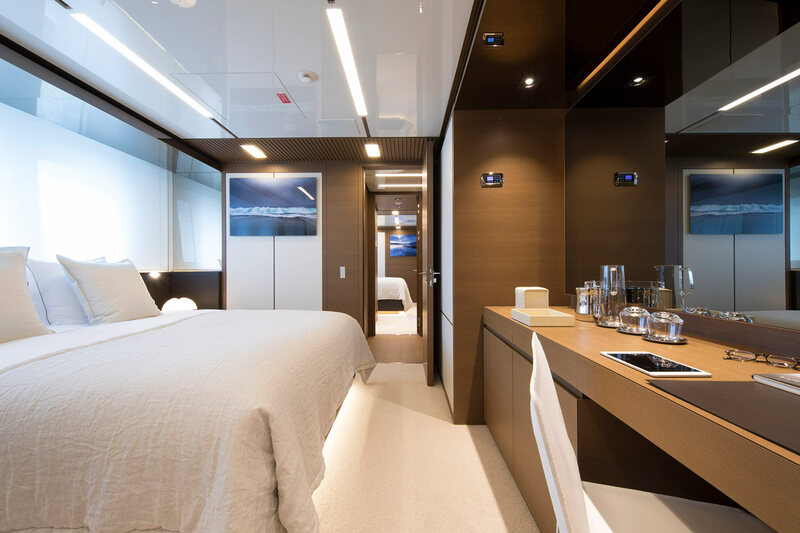 Launched in 2017, the yacht offers accommodation in 5 spacious cabins, for up to 10 charter guests. 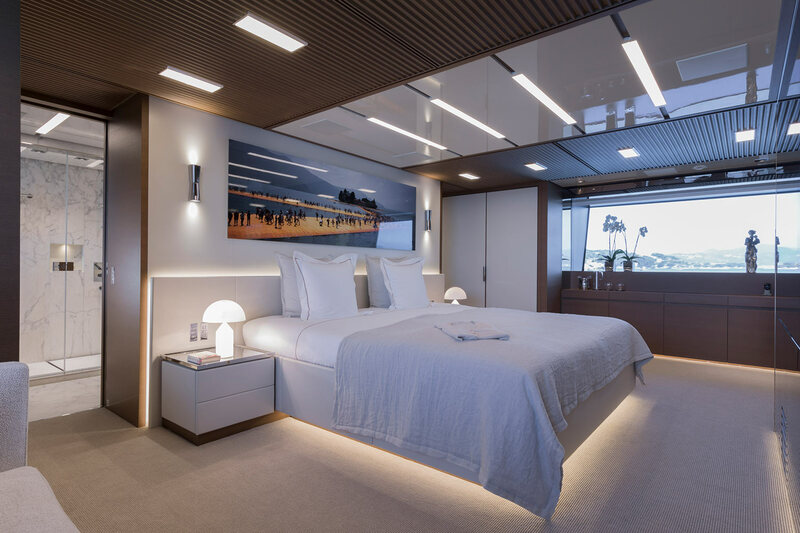 Optimal natural light is achieved throughout this luxury 5 deck superyacht that combines all the charm, style, innovation and high-quality build that one would expect from a Sanlorenzo yacht. 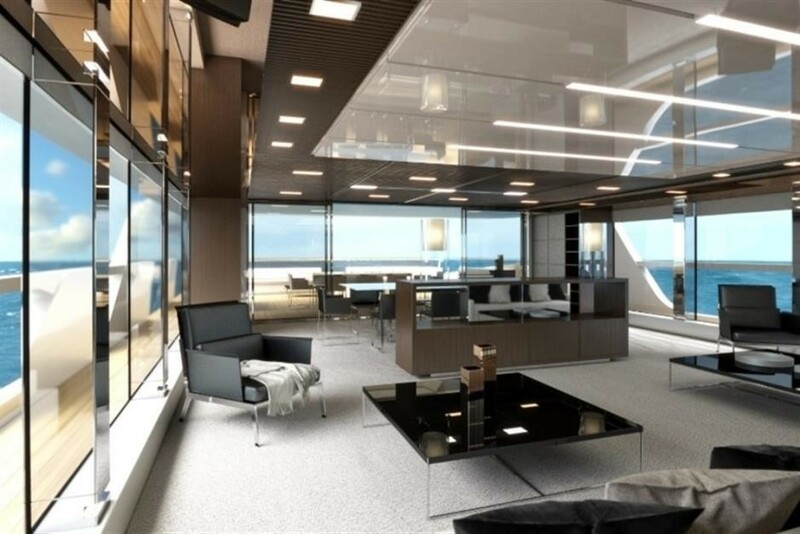 Interior space is clean and refined, with exceptional use of glass throughout. 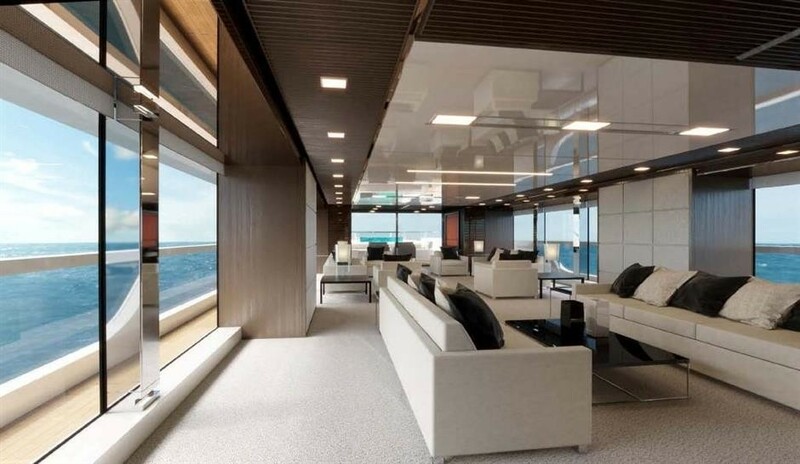 The main deck features an extremely luminous salon, with floor to ceiling windows enabling guests to fully enjoy the views while relaxing indoors. 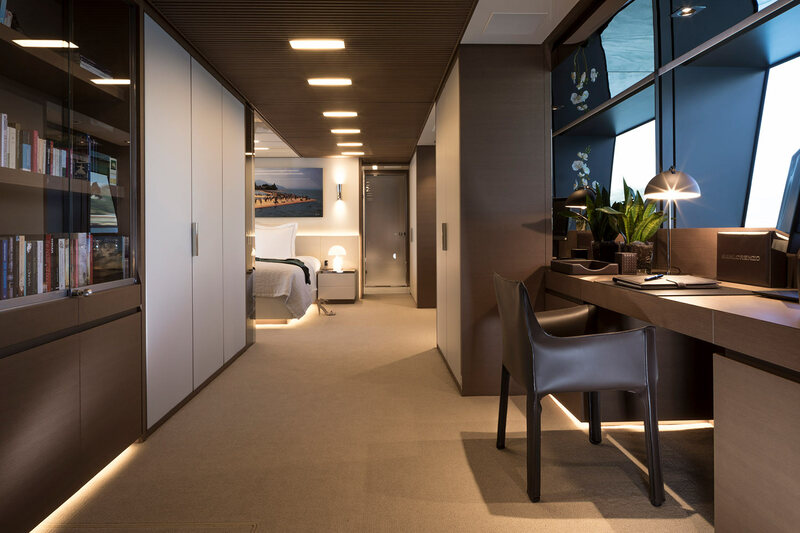 It also includes the comfortable owners’ apartment at the bow, while two VIP suites and 3 guest cabins are located one deck down. 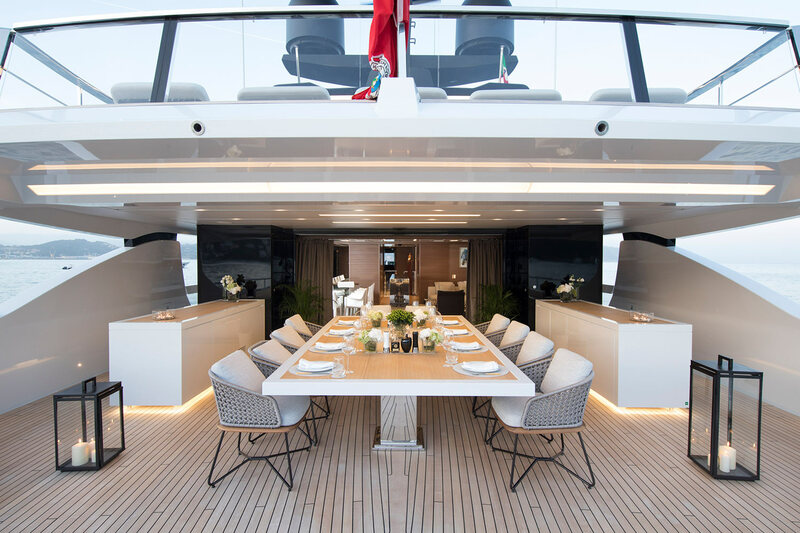 On the upper deck, a large sky lounge with formal dining salon is located aft of the pilot house and leads up to the extremely pleasant sundeck. 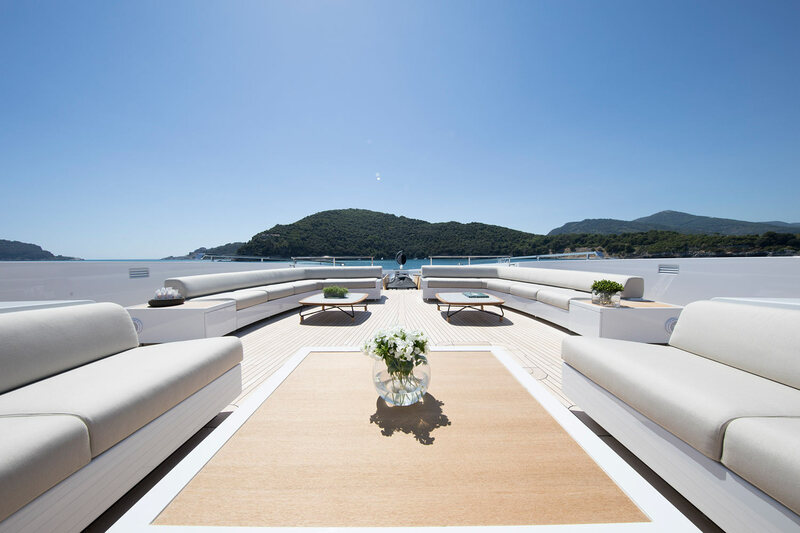 The lower deck offers a fully equipped gym and sauna, as well as a vast beach club with a chic seating area and fold-out balconies on each side of the yacht, giving direct access to the sea. 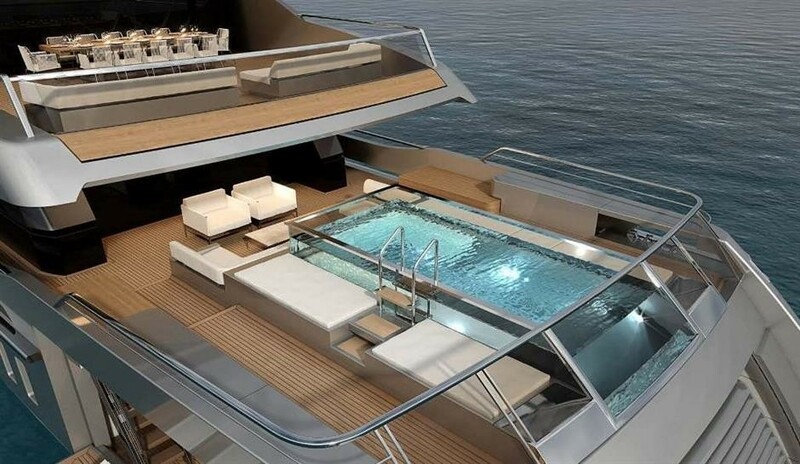 Above the transparent glass-bottom swimming pool serves as an atrium, allowing natural light to filter through. 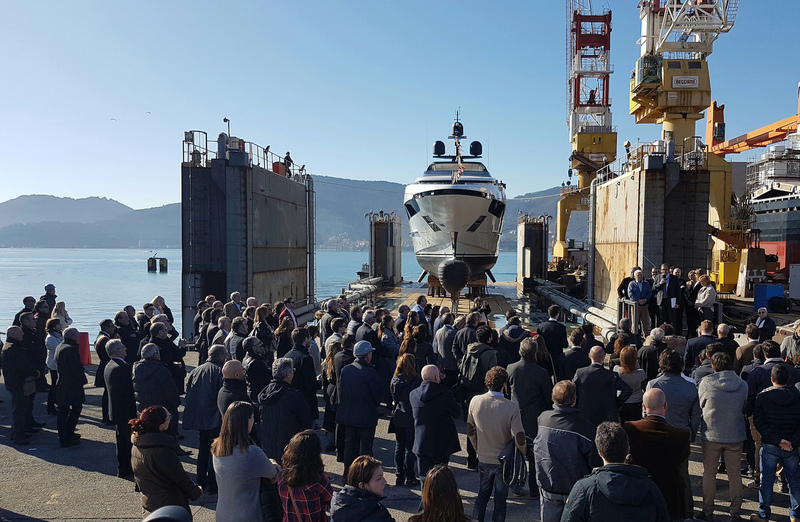 This area can also be quickly transformed into a drive-in tender bay with a controlled flooding system for a tender of up to 8m. 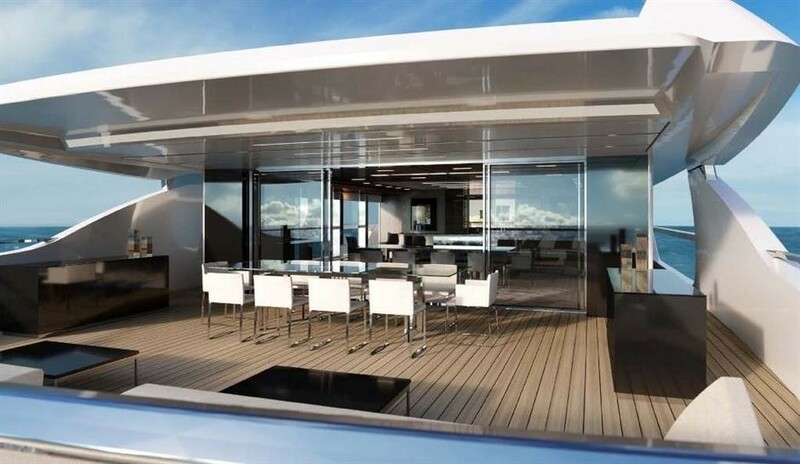 Exterior spaces on board SEVEN SINS are voluminous, with everything being planned for guests to enjoy themselves. 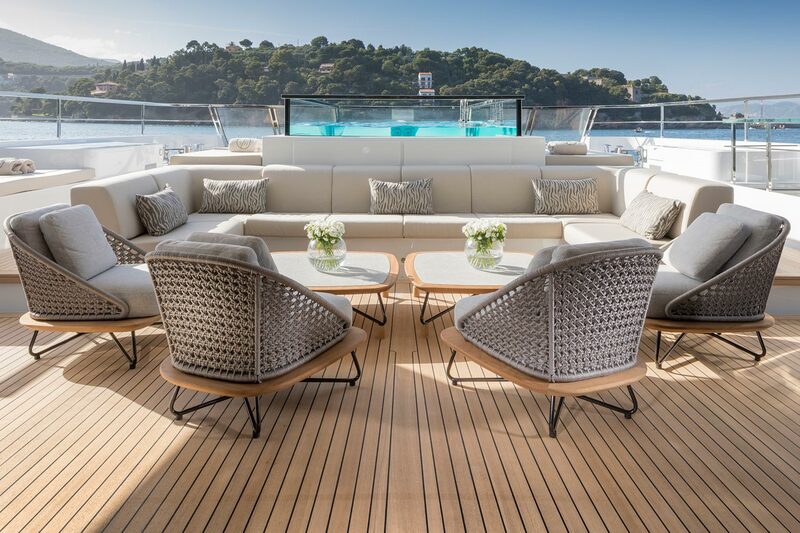 A transparent swimming pool is found aft of the main deck, which also comprises comfortable shaded seating for guests to sit back and relax on. 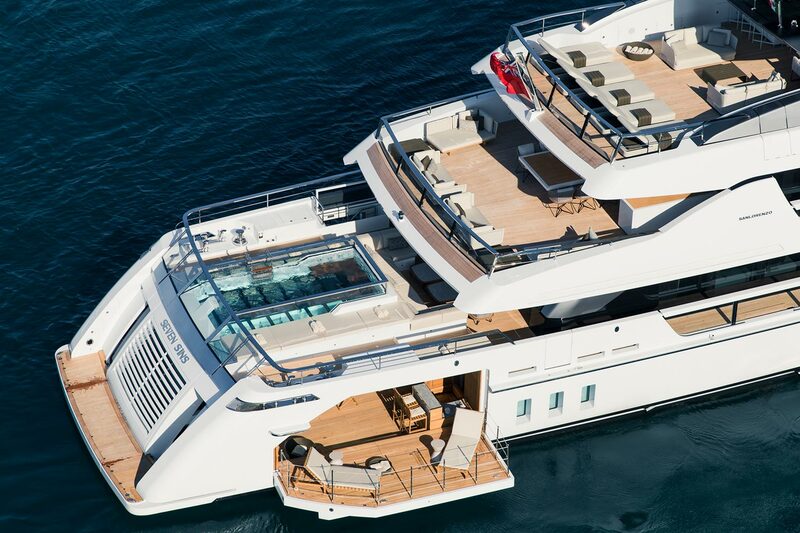 The upper deck offers two distinct areas to enjoy. 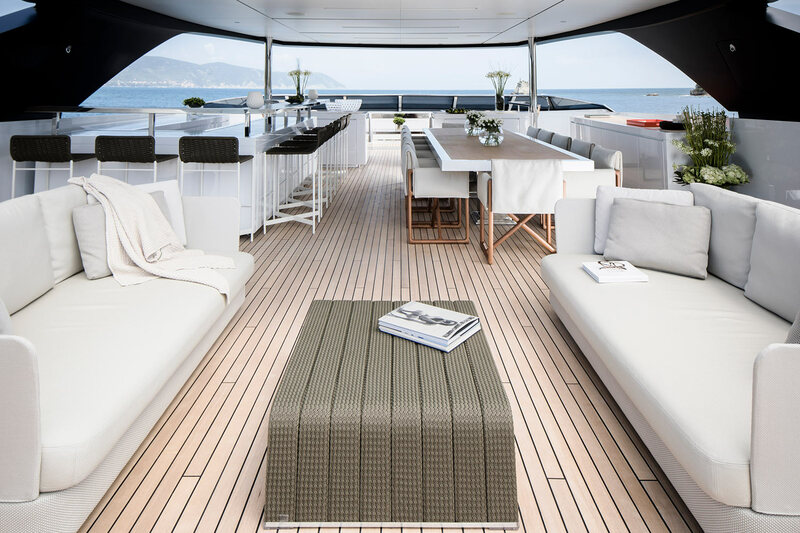 Aft guests will appreciate the large table offering pleasantly shaded alfresco dining, while forward the ample seating space transforms into generous sunpads, allowing guests to soak up the sun. 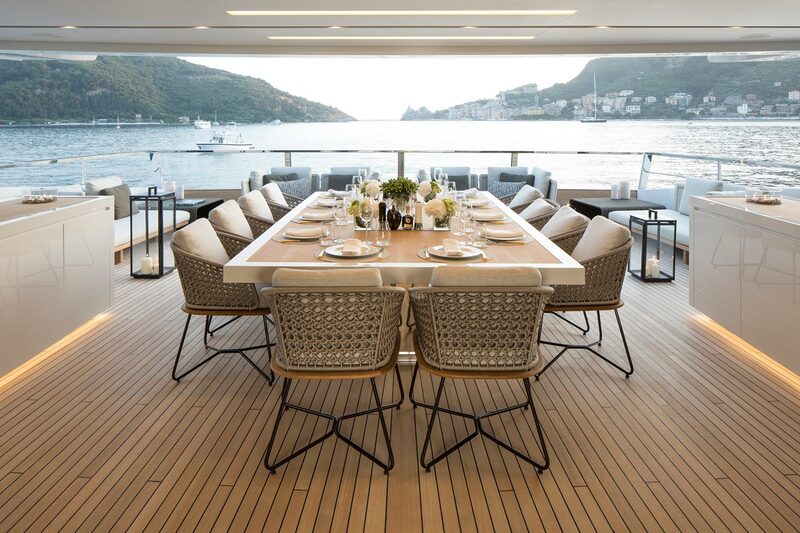 The substantial sundeck, with its’ Jacuzzi, wetbar, sun loungers and comfortable seating is also an ideal dining and entertainment area. 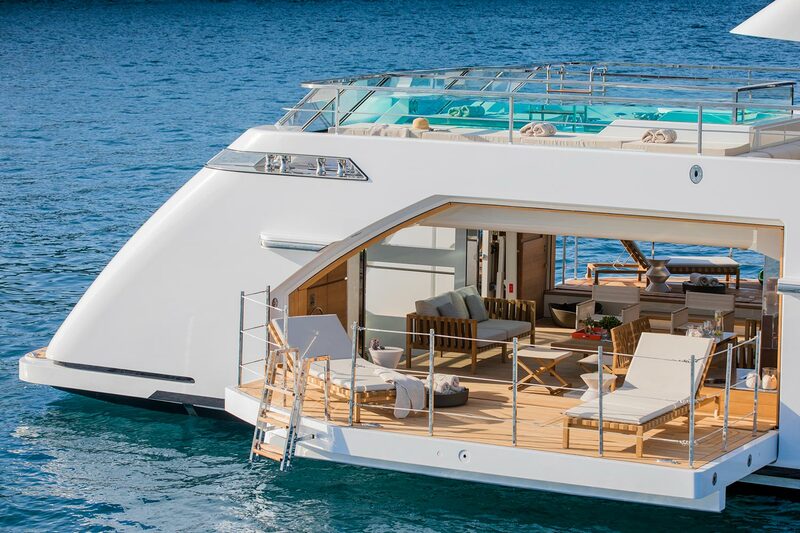 Her swimming platform and retractable terraces are perfect for guests to have fun with the fantastic array of watertoys, as well as bathe under the sun at sea level. 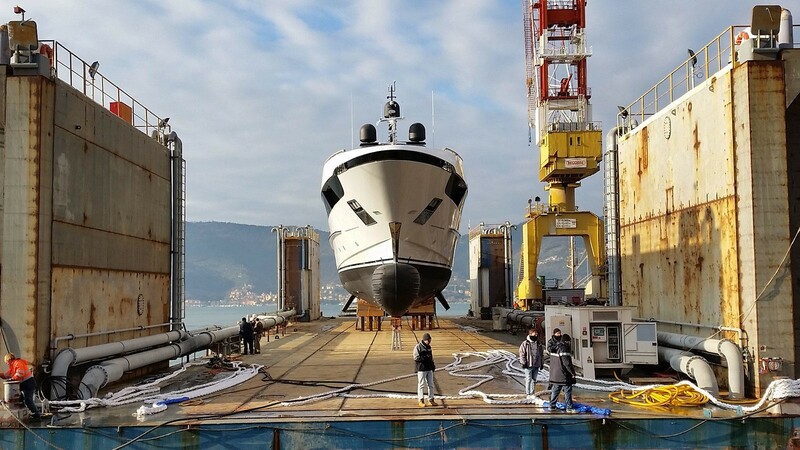 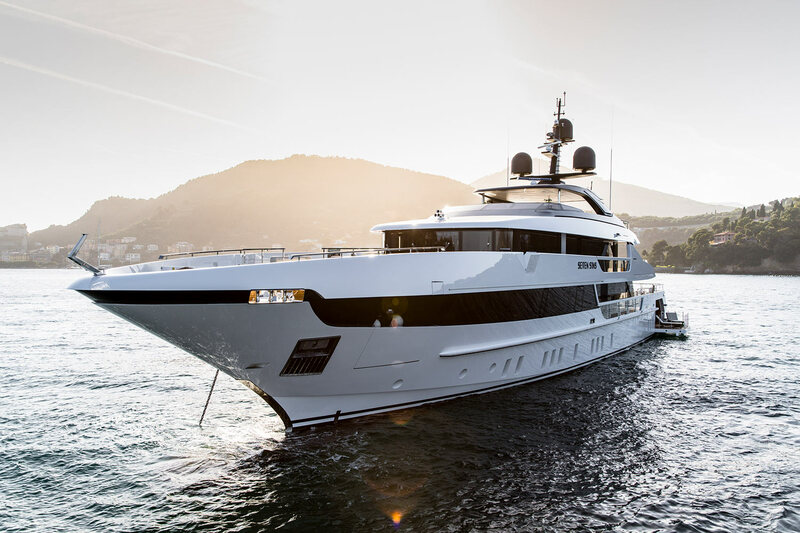 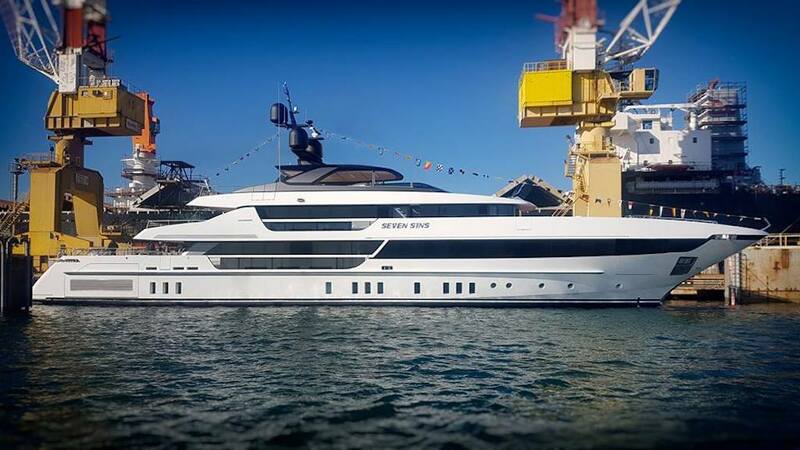 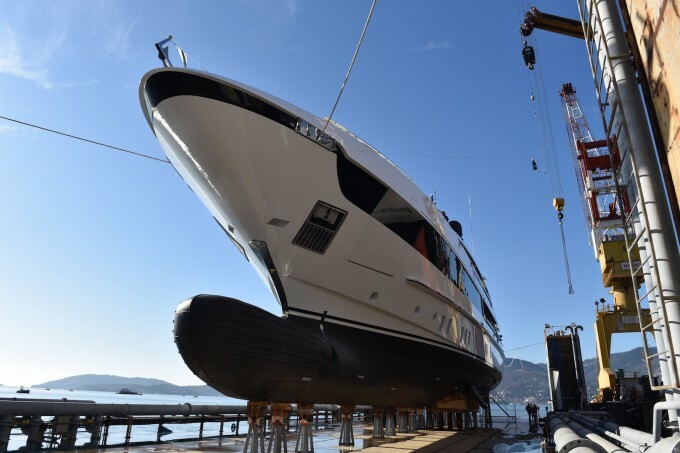 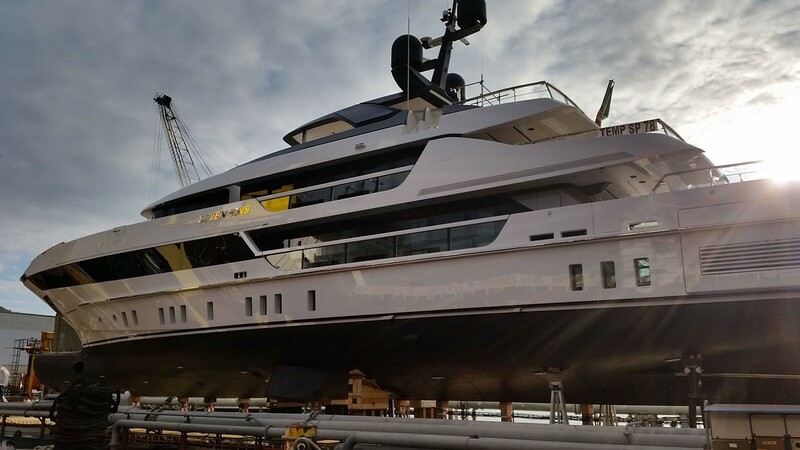 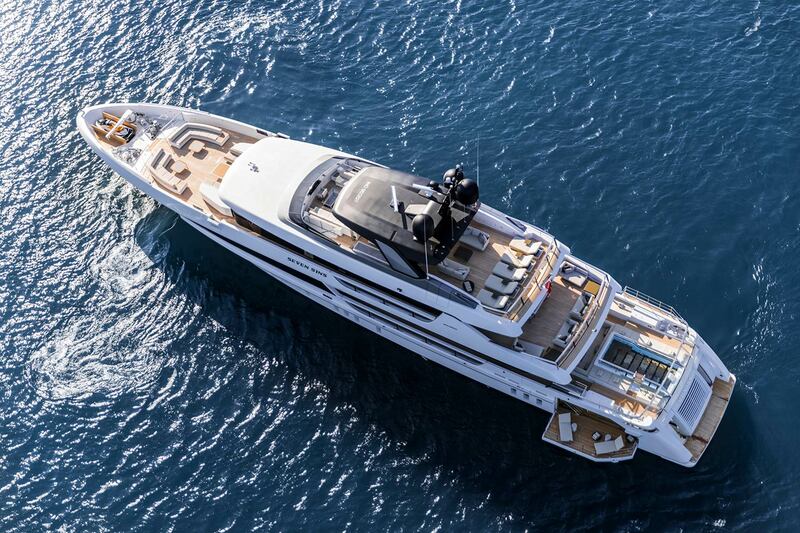 With her 2 x MTU12V 4000M63 engines, stabilizers both underway and at anchor, displacement Steel hull and Aluminium superstructure, this Superyacht cruises comfortably at speeds of 11 knots, with top speeds of 17 knots. 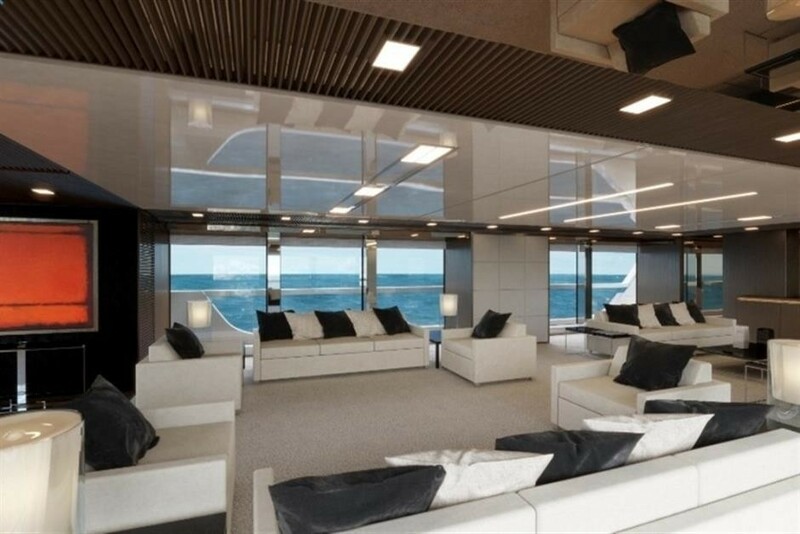 The cabins are all well-appointed, with the owners’ suite on the main deck being of considerable size and full beam of the yacht. 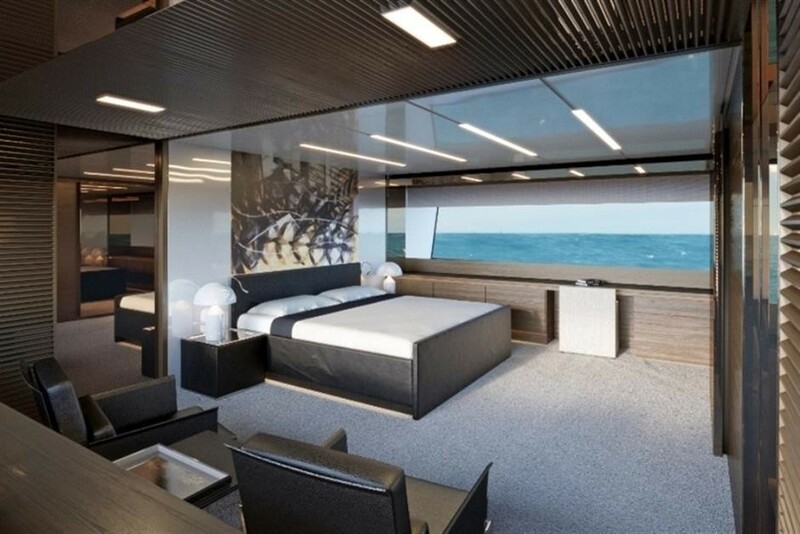 It comprising a King size bed, a seating area with a terrace that opens out onto the sea, a desk, a TV and plenty of storage space. 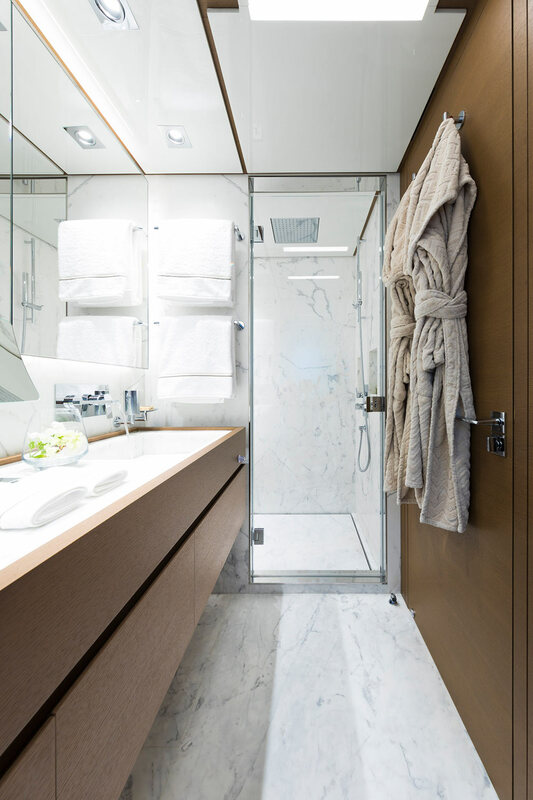 The master also includes ensuite facilities complete with a bath and shower. 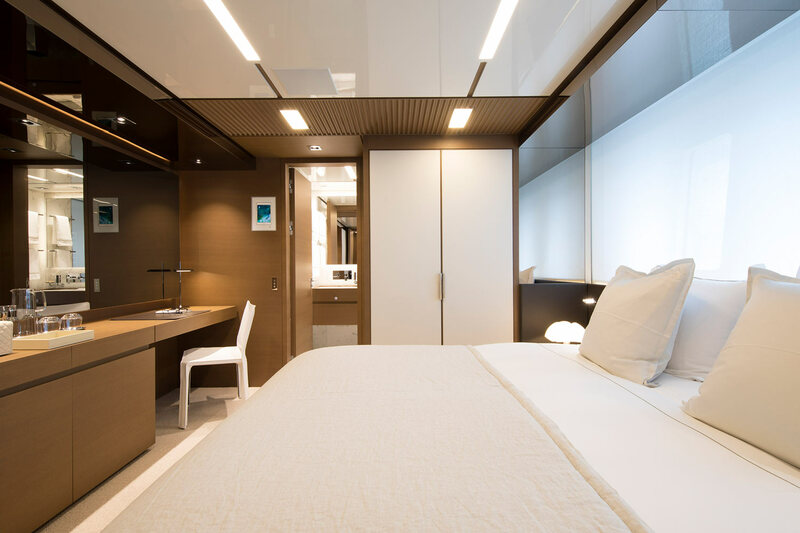 The 2 VIP suites as well as the 3 guest cabins are also ensuite with double beds and located on the lower deck.